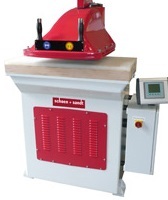 American & Schoen Machinery Company is your reliable source for German-quality cutting boards. These boards are available in different durometers and sizes and are suitable for all types of die cutting machines - swing arm clickers, traveling head presses, full beam presses and roller cutting machines. Our cutting boards offer maximum result, accuracy and life of both board and tools. Surfaces can be smooth on both sides or roughed on one side for bonding sheets. Do you have a special application that requires a custom-sized cutting board and/or different durometer? Let us work with you to find just the right cutting board for your specific process. Uses: Universal use, also as disposable cutting board of 3-12mm thickness. Cutting Material: Textiles, felts, fleeces, foam plastics, leather, insole materials, rubber, foils, and other soft materials. Uses: Our hardest cutting board for cutting polyamide and difficult-to-cut materials.